I love it! I haven’t had a Pop Tart in years, but I am definitely excited about this little bit of story! (Maybe not crazy-eyed excited like the lady in this photo, but still excited!). Pop Tarts World has opened up in Times Square in New York City. The pop tart store will allow you to custom make your own pop tarts, custom make your own 12 packs and taste 30 original recipes!! Now that sounds just awesome! There’s supposedly something there for everyone — even a light show at night!! Also, the store will sell delicacies such as “pop tart sushi”! Rest assured, Pop Tart Sushi is not a fish flavored pop tart! No — it’s different flavors of pop tarts, minced, then wrapped in a fruit roll up!! YUMMY!!!! That’s enough sugar to get me going for my whole 6 hour radio show!! 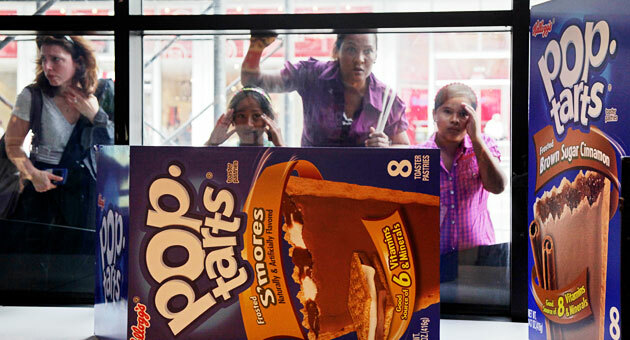 If you want to visit Pop Tarts World, you’ll have to go to NYC before January 2011 — time at which Kelloggs will evaluate the business opportunity and see if this venture is as hot as previously believed. Don’t forget to bring me back some pop tart sushi! Betty White Shakes her Booty! I thought they didn’t sell them anymore. I also have not had a Pop Tart in years. Not sure of pop tart sushi… guess it would have to be an aquired taste.